Are the staff here trained to give short measure, because they were all doing it when I popped in last week?? The beers themselves were in OK condition and I had a decent pint of the Rugby World Cup charity beer Wooden Spoon, but had to ask for a top-up. Good Youngs house away from the noise of Brixtons main drag. Blonde on top form, nice garden at back and additional seating out on the front. Popped in for my first visit on Friday night on my way to Brixton Academy. Usual range of Young's ales with the addition of Winter Warmer which at 5.0% was very good. Busy & pretty trendy not what you would of thought a back street Brixton pub would of been like 10 years ago, now it’s more than norm than not in this area. Stripped floor boards, books on the shelf, fancy wallpaper, food on offer, large coffee machine and very smart gents toilets…no wonder this pub features in the Good Beer Guide. 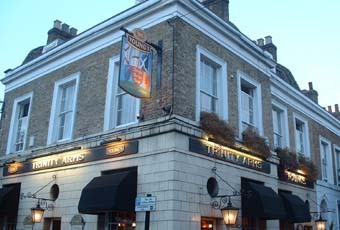 All in all a very pleasant pub and just a stone’s throw from Brixton station.